As the Syrian civil war enters its 8th year, frustration grows amongst the millions of people displaced in refugee camps across the world. An estimated 11 million Syrian people fled Syria when the civil war struck in 2011. As of March 2018, UNHCR counted nearly 5.6 million registered Syrian refugees worldwide, many of those located in refugee camps across Europe and the Middle East. Just one hour North of Athens, situated in the small town of Ritsona, a refugee camp houses over 850 refugees. Established in 2016, Ritsona refugee camp took in refugees mainly from Syria, Iraq and Palestine. Today, the camp’s demographic is ever changing but the uncertainty still remains. We spoke with residents about their experiences in camp and back home in Syria since the beginning of the war. WARNING: Content might be disturbing to read for some audiences. “In 2011 I was arrested for failing to carry my ID card, I was in jail for 12 days. A year later in 2012, I was arrested again for participating in demonstrations that opposed the government. This time I spent 38 days in jail and a further 15 days in hospital after being tortured by prison officers. The hospital had no security and I managed to escape before I could be returned to jail. My father was an officer general in the Syrian army and wanted to leave the regime. He knew information about the government and was executed after he tried to leave in 2015. Being the son of an officer general meant I was a wanted man. I needed to leave Syria. In the same year, two of my cousins were killed in an airstrike. My brother was shot in the head and suffered brain damage in Douma; he is still unable to walk properly. The bullet is still in his head because my family feared going to a government run hospital. An ordinary hospital would’ve been too scared to treat anyone with injuries caused by government officials. Now, my mother and sister take care of my brother in Syria. In 2017, I paid 1000 Euros to get from Idlib to Turkey after trying four times previously. Smugglers opened a passage in the wall when we arrived at the Turkish border, it was three metres tall and we had to get over without being detected. After I arrived in Turkey, I spent 13 days in a forest. Two or three days were spent surviving in the forest where we didn’t know if we would wake up to see another day. The forest was dangerous, it was damp and lacked shelter. I came to Greece in November 2017 through Turkey. I paid smugglers $350 to get onto a boat to Chios, Greece. Smugglers were taking less money for Syrian people at the time. The boat ride took approximately 40 minutes to reach land; there were about 60 people on-board, amongst them 20 distressed children. I came to Ritsona refugee camp after living through the war for seven years. Camp seemed like paradise in comparison to Syria. There are positives and negatives in every country but at least I know Greece is a safe country and have been very accommodating to refugees. The police here know about human rights and respect people unlike what I experienced in Syria for years. Lots of countries refused to take in refugees so I am forever grateful to Greece. I would love to bring my family to be with me in Greece. It isn’t safe for them to travel alone. I want to try to study or get a job here in Greece but my priority is to bring my family to Greece or Europe. “I am from Afrin in Syria where I lived with my wife and daughter who is almost two years old. In 2010, I spent one year in prison for political reasons before the war started. 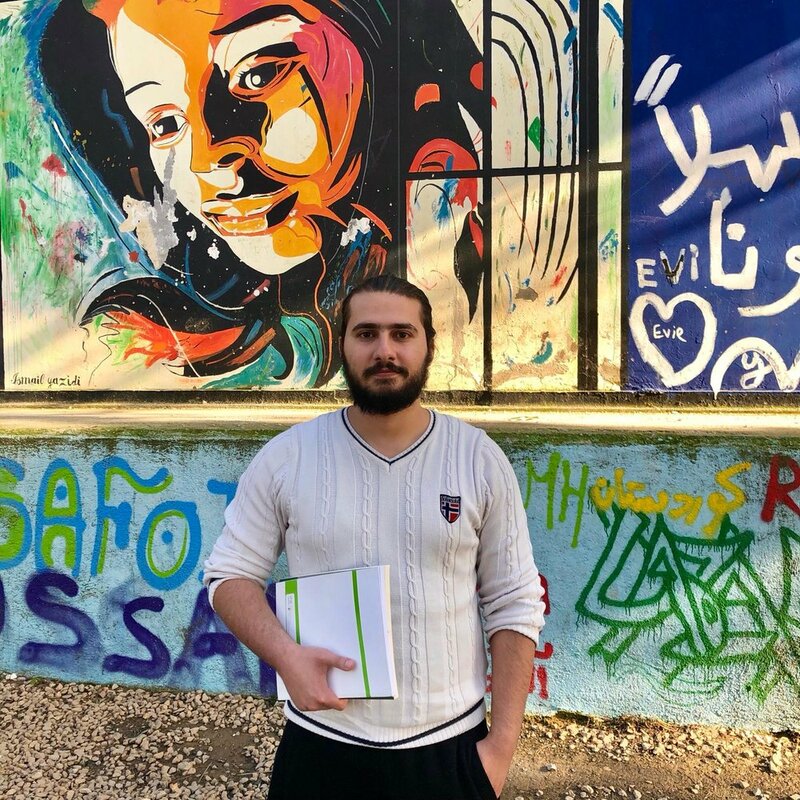 I had to leave Syria because I am wanted by the government to join the army. My whole family is still in Afrin, including my parents. I’m worried for them because Turkey has occupied Afrin and people are being killed. To leave Syria I walked along the Turkish border for three days and then spent a few days in the wilderness before being picked up by a car. I came to Greece in a boat and left my wife and daughter in Turkey where they are safe. I have lived in Ritsona refugee camp for four months. I stopped studying in Syria as soon as I was arrested so have been attending I AM YOU English lessons to pass the time. The English language can be used anywhere in the world, it will pay to know how to speak English in the future. If it wasn’t for the classes and the nature around the camp, I would go mad with boredom. There are some tensions between the Arabs and Kurds in camp but we need to learn to live together. We have all lived through the same war. “I was 15 years old at the beginning of the war. Everyday we lived not knowing when missiles or bombs would hit us. It became hard to remember what life was like before the war. People changed after the war, they became unrecognisable. Everyone would talk about Turkey and how they were accepting refugees. All of our closest neighbours and relatives left to take their chances in Turkey. We didn’t know who had died and who was still alive after they left. The siege became so bad in Deir Ez-Zor that we became strangers in our own town. They were in charge of everything, water, nature, animals and food. Teaching stopped because teachers were threatened when they tried to enter the town. Life was like this for three years. I was studying before the war, now at 18 I was getting ready to take my exams when there was a ban on all exams and university admissions. Despite not knowing or having loved him before marriage, we lived together for 10 joyful months. One day when my husband was leaving for work, a missile hit him in his head and he spent eight days in intensive care. I was eight months pregnant when my husband died. The biggest sorrow in my life is knowing that my husband never met his son and my son will never meet his father. After my husband died, I told my mother that I wanted to leave Syria. We left Deir Ez-Zor and were placed in a Kurdish town in the middle of the desert. We were in tents, hungry and exhausted for 25 days. A smuggler promised us the world if we gave him all of our money and valuables, he said he would take us to Turkey where we would have money, a house, clothes and everything we’ve dreamed of. At this point we were desperate to leave Syria and headed towards Idlib with him. He said we would arrive in Turkey in two hours but we were on the road for two days without water, food and surrounded by the sound of airstrikes. My son was 20 days old and was about to start a life in Turkey where we were promised paradise. My life in Turkey was much worse than Syria. The Turks didn’t treat us like humans, we had no heating or blankets in our tents. We spent 40 days in terrible conditions and were disrespected by so many people in Turkey. We had heard people talking about leaving Turkey and travelling to Europe. The conditions were better and people weren’t going without shelter. My mother and I put our trust in another smuggler and set for Azmir where a boat was waiting for us to board. There were many people on the boat and the smuggler hadn’t paid for someone to steer the boat so one of the men on-board had to navigate. We were in the middle of the ocean, waves were hitting the side of the boat and all around us was water. We all wanted to touch land, even if it meant going back to Turkey. The boat had run out of petrol metres from the shore, all the men jumped out to push the women and children to safety. The whole journey had taken us almost two hours. We arrived at Lesbos, Greece and were welcomed with warm hugs and smiles. There were people handing out blankets, food and clothes. The Greek people treated us like humans; they wanted to help us to safety. My family spent three months in Lesbos at a refugee camp before coming to Ritsona. I have been at Ritsona camp for a year exactly. I am grateful to Greece for all they have done for us. In the future I want study journalism so I can get the truth out and bring justice to all those who died needlessly. UNHCR believes “enhanced connectivity can improve refugee well being”, often used as a means to facilitate communication with loved ones and for entertainment purposes. The Internet has become a necessity for refugees who are looking for ways to pass their time or catch up with estranged loved ones. Ritsona refugee camp is home to over 800 residents, all able to connect to the camp’s free Wi-Fi network, ‘NETHOPE’. Both residents and volunteers are able to use this for 24 hours a day, although it is not the faster or strongest of networks. On a daily basis at Ritsona you will see residents glued to their phones, either in a battle of connectivity to the Wi-Fi, a deep phone conversation or an impromptu photography session. Whilst spending some time in Ritsona’s local coffee shop, Gold Café, I noticed a crowd of young men all glued to their phones and interacting with one another about what they were doing. It appeared that they were all involved in a live game, playing for the same team. I listened intently to understand the aim of the game and then started speaking to one of the men who had died in the game. It seemed like an intensely passionate time to interrupt anyone else’s game, this was a serious match. Recently however, Ritsona’s Wi-Fi has been used to play popular Canadian game- PUBG. The game is downloadable on IPhone and Android devices free of charge and involves multiplayer interaction. Players must log in through their Facebook accounts and can play with their friends in the same team. The game involves battling 100 other live players until they are all eliminated and your team is left standing. Michael, 20, told me how almost every young man in the camp has the game downloaded on their phone. Residents can speak to one another through the game at the same time and are often battling one another from their individual ISO boxes. “Sometimes we sit together and play, other times we sit alone but talk to each other through the game. I play the game because there is nothing to do in camp; it’s a way of passing time. The game itself is fun and I can play with friends in and outside the camp. People have even married from meeting on the app so it does have a lot of benefits”. On the importance of WiFi at the camp, Michael explained that it is crucial residents have regular access to Internet. “People use the internet for all sorts of things not just games. They use it for information, to pass time and for learning”. Internet is often seen as a luxury when in actual fact, even the poorest of countries have access to internet services. The necessity for consistent internet access in refugee camps like Ritsona is great. Considering the amount of time most residents wait for their documentation and asylum cases to be processed, the ability to access free WiFi is significant . Jordan comes from the Democratic Republic of Congo and has been at Ritsona refugee camp for 10 months. He shares with us his daily life at Ritsona and his dreams for the future. “In my country, I studied informatics and management. I wish to be engineer or businessman. Before I was born, my mother had a dream that I would work in administration, I hope one day I can please her and make this dream come true by working in an administrative post. Both of my parents passed away, my siblings are still living in Congo. Helping others makes me happy. I do it in the camp, in my everyday life. It is not always easy because we all are different, we have different cultures and it is hard sometimes to understand each other. I will always keep trying. Sometimes it is hard to live with the other nationalities. For some people, it is the first time they have seen or lived with black people. I think in some countries, they hate black people or anyone not the same as them and they bring this hate with them. We are all evolving together, day by day. I see their change and I try to evolve too. I spend lot of time with I AM YOU and Lighthouse Relief. I participate in activities like tennis, creative arts, resident meetings, German classes, English classes and Greek classes. I have also given some French lessons. I want to learn many languages to be able to speak with everybody in the camp. For me, being able to communicate with people makes the difference between having a good and a bad day. When I learn new things, it makes me feel good and I feel less stressed, it helps me to relax. Every language has its own drawer in my brain- English, German, Greek and French. I dream of stability in my life and feel happiest when I am useful, helping people. I want to be a businessman or engineer or at least do something that is useful for society”. “I hope one day, my baby will forgive me”… difficult words from one of Ritsona’s newest mums, Rashida. Before giving birth to her baby in December, Rashida spoke with I AM YOU about her fears of raising her child in a refugee camp. Rashida left Morocco and arrived on the Greek Island of Lesbos where she fell in love and got married. Shortly after marrying her husband, Rashida moved to Ritsona refugee camp. She has fears, anxieties, dreams and huge guilt on motherhood. “It is really difficult being a pregnant refugee, I never imagined I would be living in a refugee camp. It is hard to imagine I will have a refugee baby. My one wish is that my baby won't hate me. I am afraid to have the baby here at camp because it is not a good place for a baby to be born and raised. The camp does not have access to doctors during the night, which scares me because if my baby became sick, I would have to call for an ambulance. We have doctors and midwives at camp, but when they can't do anything, I am sent to Chalkida or Athens. Ritsona is remote and far from Chalkida town so I have to wait for the Wednesday bus to go to Athens if I ever need anything. It is really difficult to be and feel isolated; it is stressful for me as a first time mother. Conditions were much worse in Lesbos but at least we were not isolated, we had more access to transport. I wish we better had transportation at Ritsona; it would be easier if I ever needed anything for the baby. Life in camp is tough far away from my family, in a different country, with a different culture and alone in this place. At Ritsona, we received milk distributed but not milk suitable for babies. Baby milk is very expensive for me and I don't want to breastfeed. In my home country of Morocco, we have ceremonies at the hospital for the baby. All the family attends and you are not alone. My family doesn’t know that I am pregnant, I wouldn’t dare tell them, and I wish they could be here with me. I want stability for my baby and me so I would like to stay in Greece. I want to learn Greek even if it is not easy and I hope to have Greek friends. We live in a camp where the main language is Arabic, I only speak Arabic with people and wish to be closer to the local Greek people”. Deb volunteered with I AM YOU from December 2018 to January 2019 as an adult English teacher. She serves on the San Francisco Conservatory of Flowers Advisory Board and observes people enjoying public garden spaces on a regular basis. 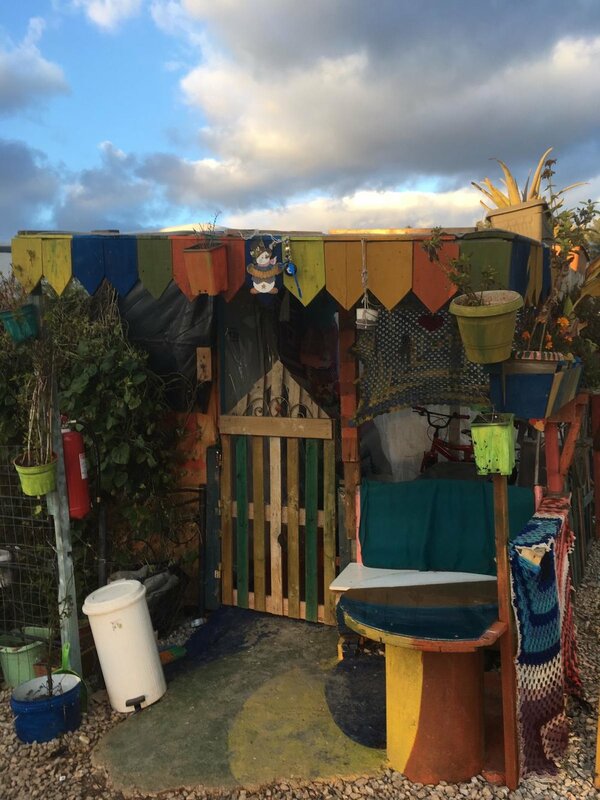 Before Deb left Greece and returned to teaching her classes in San Francisco, USA, she wanted to share a short blog piece on the need for refugees to enhance their ‘homes’. In a refugee camp residents here, as elsewhere, crave their own space. Like me, some people give up an amount of living space for a small garden. Watching plants thrive, flowers bloom, herbs and grasses reach for the sky, creating small moments of joy for us. They fill our life in tiny increments of sweet memories for which we can be grateful. 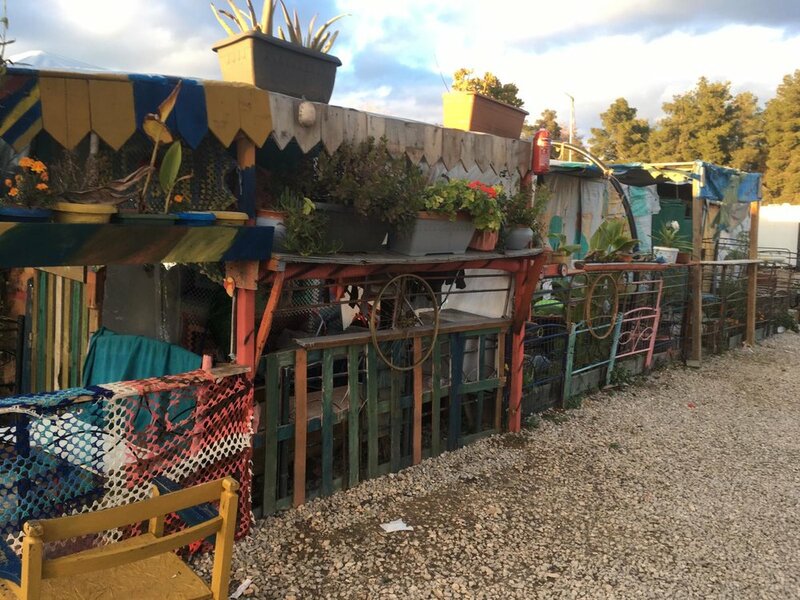 How much more poignant to see gardens in a refugee camp in Greece. As a short term volunteer English teacher here on my winter break, I walk through the bleak white container shelters searching for indicators of emotional stability and health; a homemade bench from crates, an iron bed with a cat on top and puppies underneath, a laundry line weighed down by colorful children’s garments. Around one corner I spot a homemade garden. Cannas anticipate spring. Geraniums huddle against the frost in their pots. An agave stands guard. Bean runners left over from summer defy the chill. “I like your garden”, I say to the woman in the doorway. I point to her garden and she nods. She smiles to meet my own. Ritsona, this holding area, as in so many in Greece is a no man’s land, a time warp, where plans for the future are uncertain. Hoping itself is painful and despair sets in. Just waiting for an interview from asylum services can shave a year from the residents’ lives, then a transition and hopefully life beyond this camp begins. Where, when, and how, all vocabulary words I teach my students in their level 1 English class, are unanswerable right now. Living with uncertainty, a garden provides more than color, fragrance and edibles. It represents hope that the natural order of the world will resume, that children will stretch in their own beds and put on new shoes instead of cast offs. Unaccompanied minors will build a career and a family of their own. The rudimentary understanding of English for the digital world will be an asset even if resettlement in an English speaking country is unlikely. A garden, fifteen feet by eight feet, is both a consolation and a promise. I took the greatest chance of my life when I boarded a small dinghy off the coast of Turkey. More than 200 people risked death alongside me that night as we crossed the Mediterranean Sea from the city of Izmir. It was pitch dark, the middle of the night, I remember the rain. It was falling hard and the seas that night were very rough. I ended up in the water and was forced to learn to swim that night because, if not, I would have drowned. I did my very best for what I guess was more than an hour. Then a boat arrived and helped us all out of the water. For a moment I was thankful, but what lied ahead was worse than anything I could have imagined… we were taken to Moria Camp. I lived, I should say… I survived in Moria for 7 months. I endured many hardships inside that camp and I pray for those who still remain. I was sheltered in a tent but it was brutally cold and there were no bathroom or toilet facilities. Living in Moria is awful, there are no words. Sometime along the way, I started experiencing hallucinations, reliving over and over again what happened to me during my journey and unable to see past the difficulties I faced on a daily basis. At times, I felt as if I was communicating with my dead brother. I remember those memories today and my mind now goes to prayer. Today, I live in Ritsona Refugee Camp. I have been living here for the past 11 months. Here, I feel better and I feel comfortable. I live in a proper caravan and very far from many of my past difficulties. I have a proper place to sleep. I have friends. I am a spiritual person and I try to be helpful in my daily life and wherever I am needed. I enjoy translating for my Africans brothers and I am also the coach in our caravan gym. I want to be someone. I am already a person, but being someone is different. A person is a human but being someone means to be a person who brings something to others, who can help, who can make people smile. Every morning, I have a ritual. I always take some time to look up at the sky and I thank the Lord for my day. In Cameroon, being rich means having many kids and many wives. But nowadays, in a more globalized world, being rich means owning material things and real estate property. It was difficult to achieve this in my home country. I studied Marketing and I found it challenging trying to find a job in this field. I experienced the closing of our local businesses and the opening of private ones led by foreigners who favored expat hiring practices as opposed to native Cameroonians. As a young, vibrant man I found it overwhelmingly frustrating not being able to integrate myself into my own society. For me, richness is love and I believe love should be shared. The important thing right now in my life is not where I live but where I feel alive. The best feeling for me is when I’m sharing with people, when everybody feels good and you are part of their happiness. This is the greatest wealth. Someday, I would like to be my own boss and create a company in which I could be useful hopefully in my country. I’d like to improve transportation in Cameroon. I would also like to create an NGO where I would help orphans and people who don’t have enough for living. Imagine having to leave your homeland forever for the unknown. Imagine living with daily thoughts of how others elsewhere in the world live in difficult situations. A chance coincidence led this couple to I AM YOU. Melanie has been a volunteer with I AM YOU for 5 months. She just finished her time with us but part of her will stay here always... in the hearts of the children she was taking care of every day. Pre-school will miss her bright smile, high spirit, ukulele skills and most of all her dedication towards positively impacting their educational needs.